Deploying and Managing Services with tools such as CloudFormation, OpsWorks and Elastic Beanstalk. Learn from the AWS subject-matter experts, review with proven study tools, and apply real-world scenarios. If you are looking to take the AWS Certified Solutions Architect Associate exam, this guide is what you need for comprehensive content and robust study tools that will help you gain the edge on exam day and throughout your career. 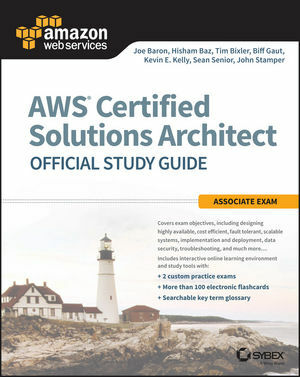 The AWS Certified Solutions Architect Official Study Guide: Associate Exam is written by the AWS?team of Joe Baron, Hisham Baz, Tim Bixler, Biff Gaut, Kevin E. Kelly, Sean Senior, and John Stamper. 14. Which of the following statements about Amazon DynamoDB secondary indexes is true? A. There can be many per table, and they can be created at any time. B. There can only be one per table, and it must be created when the table is created. C. There can be many per table, and they can be created at any time. D. There can only be one per table, and it must be created when the table is created. 14. Which of the following statements about Amazon DynamoDB local secondary indexes is true? B. There can only be one per table, and it can be created at any time. C. There can be many per table, and they must be created when the table is created. 14. D. There can be one secondary index per table, and it must be created when the table is created. 10. You are working for a small organization without a dedicated database administrator on staff. You need to install Microsoft SQL Server Enterprise edition quickly to support an accounting back office application on Amazon Relational Database Service (Amazon RDS). What should you do? Please update the following in Question 19. A. Global secondary indexes can only be created when the table is being created. B. Local secondary indexes can only be created when the table is being created. C. You can only have one global secondary index. D. You can only have one local secondary index. 20. D. Transfer domain registration from current registrar to Amazon Route 53. 18. B,C. When connection draining is enabled,..
A. Amazon RDS supports Microsoft SQL Server Enterprise edition and the license is available only under the BYOL model. the license is available only under the BYOL Model. Please change the following in Answer 19. B, D. You can only have a single local secondary index, and it must be created at the same time the table is created. You can create many global secondary indexes after the table has been created. 20. D. You must first transfer the existing domain registration from another registrar to Amazon Route 53 to configure it as your DNS service. E-books are offered as e-Pubs or PDFs. To download and read them, users must install Adobe Digital Editions (ADE) on their PC. E-books are non-returnable and non-refundable. To learn more about our e-books, please refer to our FAQ.